Chris Sims: Hello everyone, and welcome back to ComicsAlliance's exhaustive (and exhausting) look at the Teenage Mutant Ninja Turtles films, the franchise you chose for us in our last vote. 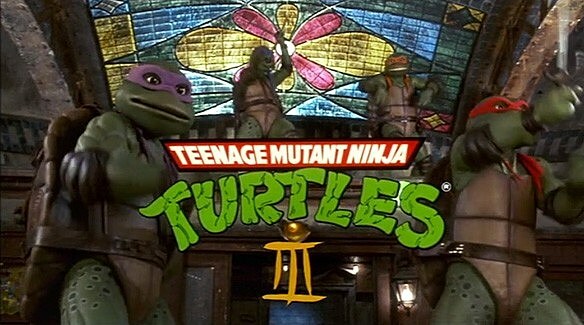 Over the past few weeks, we've been revisiting some fond memories with the first two movies, but this time around, we're heading into uncharted territory with Teenage Mutant Ninja Turtles III. Matt Wilson: Uncharted for you. I saw this movie in the theater, and learned the value of a dollar by virtue of wasting eight of them on it. Chris: Yeah, I've never actually seen this one, which is pretty weird when you consider that it came out in 1993, which I think still qualifies as the height of Turtlemania. I take it it doesn't hold up? Matt: It didn't hold up THEN. Everything about is just off. The turtle costumes take a huge step down in quality, the story seems inconsequential and doesn't tie into the other movies really at all, and it amps up the silliness way past the point of tolerability. It feels like a TV show, and in the worst possible way. Chris: In that case, I think we can both be glad that we didn't decide to watch The Next Mutation, the actual live-action TMNT TV show. Matt: That show stemmed from the intended fourth movie, but this movie didn't do well enough to warrant it. The director of this movie, Stuart Gillard, comes from TV, so the feel makes sense. Interestingly enough, more of the players from the first movie actually are in this one than the second one. 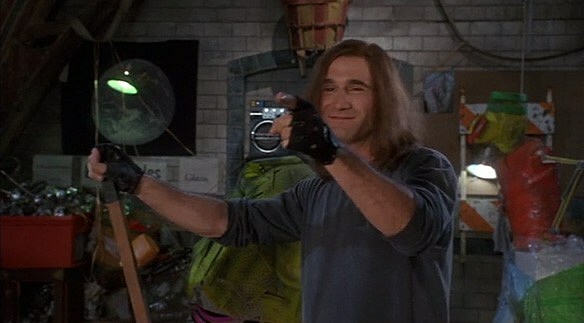 Elias Koteas returns as Casey Jones. Corey Feldman comes back as Donatello. The big, honking absence, though, is the Henson Creature Shop. It kind of kills the movie. Chris: It's noticeable, too. 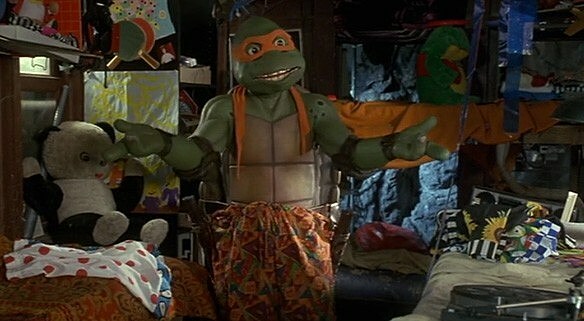 The suits for the Turtles look different - for some reason, they have liver spots now? - and even though they're still pretty impressive when you consider that there are dudes doing martial arts inside them, they definitely don't look as good. The expressive faces just aren't there, and no amount of Corey Feldman can make up for that. Matt: Also absent: Any bad guys we know. Shredder and the Foot are replaced with some frankly boring 17th Century Japanese feudal lords. Everything got more colorful as these movies went on except the bad guys. That's awful. Chris: I can see why, though. They'd spent two solid movies on the Foot, and while the first one ended with Splinter doing the heavy lifting, the sequel had a pretty decisive victory over a version of Shredder that was even more powerful than the original. 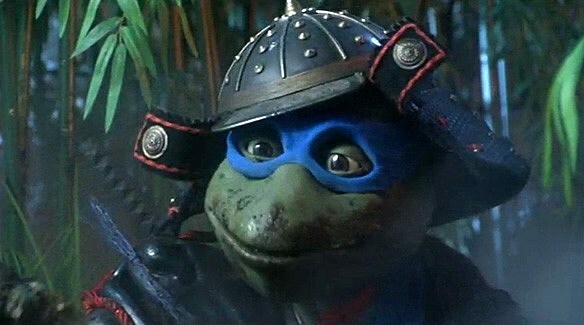 Wanting to shift things in a different direction makes sense, except that fighting Shredder is basically what the Turtles do. Without him, and with the connections to the Utrom edited out, they needed something else to do. Matt: When I was a kid, there were tons of rumors that this movie would have Krang in it, so I spent the whole time waiting for the big reveal, or for Usagi Yojimbo or someone to show up, and it just never happens. I'm getting mad about it now. Chris: Man, I didn't even think about Usagi showing up and now I want that to happen so bad. Thanks a lot, jerk. Matt: Transference of anger is what I do. Chris: Normally we'd try to go into a little more detail about the background of the movie here, but in this case, there's not much beyond the obvious: The first two TMNT movies made a lot of money, so they made another one. It wasn't very good. That's... that's basically it. Are we done now, Matt? Matt: I think we actually have to watch the movie or we don't get paid. Matt: By the dictionary definition of the word, yes. Chris: Our story begins in 1603, and right away, you can see how fast this movie is going to drop the ball whenever it can. Seriously: This movie came out in 1993. Why wouldn't they just back that timeline up a decade and give us an even 400 years in the past? Were they hoping this could lead to a big tetracentennial celebration at the 2003 TurtleCon? Matt: The original poster did advertise it was 1593. So the marketing team knew better than the writers how to handle this stuff, I guess. The only thing I can figure is that 1603 was the beginning of the Edo Period, led by the Tokugawa Shoguns, and the writers wanted to line up the story with that. Not that they seem to care much about historic accuracy in any other regard. Chris: On the one hand, I'm pretty sure historical accuracy goes out the window when you drop a bunch of pizza loving turtles through a time portal created by Sauron's mace, but on the other, I actually would be into an exhaustively researched, historically accurate TMNT story. Matt: This non-historically-accurate story kicks off with four samurai chasing a masked man, all on horseback, along a beach and into some woods. There's an on-horses sword fight as a young woman looks on from behind a tree. The samurai finally beat the guy and take him to the castle. This sounds so much better than it is. Chris: Seriously. It is the laziest swordfight I have seen since a high school production of Macbeth. Dudes are clearly trying not to fall off their horses as they just kind of touch their katanas to each other to make noise. Was this really the best take they could get? Matt: It's about the level of production of an episode of Highlander. Which is basically what this movie is. A mediocre episode of the Highlander TV show with turtles and Elias Koteas instead of Adrian Paul. Chris: Again, you're making it sound way better than it is. Matt: I almost went with Hercules, but THAT's better, too. Anyway, we flash ahead to the present to find the now very-freckly Turtles are still hangin' in their abandoned subway station HQ, whiling away their days with choreographed dance sequences. Splinter, meanwhile, has turned into one of those animatronic fortune-telling machine guys. Chris: The music in this scene sounds like a WWE sound-alike of a ZZ Top song, which is pretty rough considering that it actually is a ZZ Top song. It turns out, that's just what latter-era ZZ Top songs sound like. 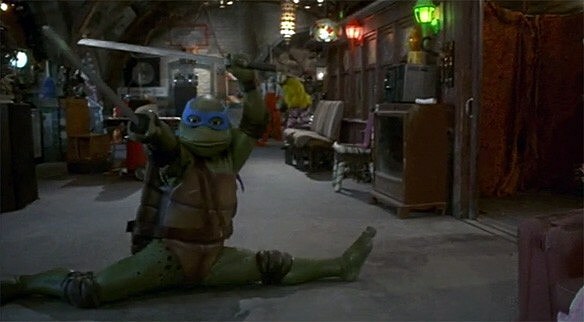 To be fair, though, the bits where the Turtles take a break from dancing to show off their martial arts skills are pretty impressive. Matt: Once they start talking, though. Oof. Their mouths don't match their dialogue anymore! Also: The dialogue sounds like it was put together from a soundboard of what they said in the previous movies. None of these lines sound like reactions to anything that's been said. Chris: There was a long minute where I thought they were just piecing together Corey Feldman's lines from the first movie. His first line is "Hold it! Oh, Raph. Come on!" and those are three separate, unrelated ideas. Also, Raph's back to complaining about how "nobody even knows we're alive," which is weird since they performed at a nightclub with Vanilla Ice at the end of the last movie. Matt: This was also not a problem he ever had before. All that seems to have transferred from the other movies is that Raph's angry. He didn't care about being famous; he had a chip on his shoulder because he thought he had something to prove to Splinter and himself. Chris: Maybe he was always secretly angry about not being famous, Matt. Perhaps that was... the secret of the ooze. Matt: Or maybe the secret was that April (who has a new, short 'do) was able to listen to a Walkman with the headphones not plugged in. Or where the lower half of Splinter's body went. Chris: Ah yes. April shows up with a few bags of "stuff" that she picked up for the Turtles down at the flea market. Which... Do they have flea markets in Midtown Manhattan? I've only been there a couple of times, but I always kind of figured that was more of a country thing. Matt: Maybe she went to the 'burbs, where her family's Southern Gothic farm is. Anyway, April hands out a bunch of stuff, including a hat for Raph that is pretty similar to the one he already has. One of the items she got was an antique Japanese artifact that she spends a long time talking about before Leo asks what it is and she has to EXPLAIN YET AGAIN. Chris: I know that we need to get to the artifact, but can we talk for a minute about how April is the worst gift-giver of all time? She basically just hands the Turtles bags of garbage. Michaelangelo gets a lampshade. Like, an actual lampshade, with no lamp, that he can wear on his head because he's wacky. The best, though, is that she gives Leonardo "a book on Japanese swords" because she apparently knows exactly one thing about him. Even this ancient artifact - which, again, was purchased at a flea market - is given to Splinter because it's old and Japanese. You know, like he is! Matt: To be fair, that's pretty much Leo's whole deal. He leads. Donatello gets a radio because, well, you know. 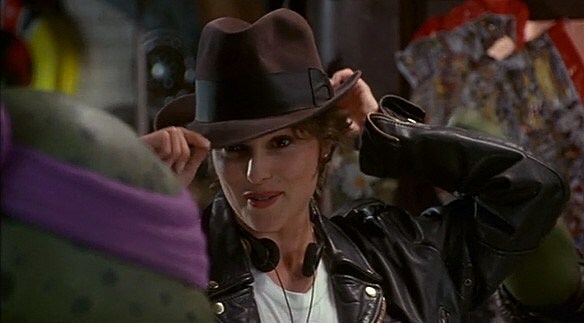 Chris: She gets Raph a brown fedora. Literally the one item of clothing that we know he already has. Matt: He can be cool but rude about how he "really needed one of those," I suppose. April blows some dust off the antique thing for a nice little transition back to 17th Century Norinaga Castle. The samurai have returned to bring their prisoner, who turns out to be Prince Zuko, home. The emperor, beloved character actor Sab Shimono, is not pleased with his son's rebellion against his "unjust war." Chris: There's a lot of arguing about who is bringing more dishonor to the family, you know, just in case you forgot this was ancient Japan, and then some dude shows up with a gun, looking like he stopped by SamuraiFest on his way to the Renaissance Faire. Matt: He's supposed to be the leader of a group of English mercenaries, but he looks like the Marquis de Lafayette. Chris: He looks like the Fifth Musketeer, Dyspeptos. Matt: From the little-known sequel where they fought King Zantac I. Zuko's still mad, so he bursts into a room where a bunch of scribes are just trying to make a living and starts breaking stuff. One of the terra cotta statues he bursts reveals The Artifact, and that makes the windows open somehow. 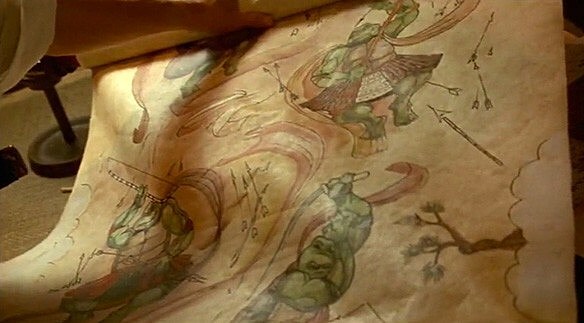 That reveals some pictures in the scrolls of some mysterious fighting turtles. I guess one of those scribes was April's ancestor. Chris: Well, it's like you said: They wanted it to be 1603 to line up with the founding of the O'Neil Shogunate. Matt: Which was nearly foiled by the Danny Clan. The artifact starts glowing, so Zuko picks it up and reads an inscription that says, "Open wide the gates of time." That makes it start glowing in the present, too. Before you know it, April and Zuko get lightninged into exchanging places. And clothes! If only April had been wearing a yellow jumpsuit instead of a leather jacket and jeans. Chris: It's worth noting that the scepter is glowing and spinning around and April is shouting "GUYS?!" and the Turtles don't bother to notice until there is actual lightning shooting out of it, because they are absolute f**king idiots in this movie. Also, you mentioned that they switch clothes, and should we go into how this doesn't make any sense? I mean, they switch clothes (which are now sized for a dude instead of a petite lady), but they also keep the stuff that's in their pockets. April is in the past, in samurai robes, with a Walkman, and Zuko looks like he's about to go wrestle with Deuce and Domino on SmackDown. Matt: The turtles are just oblivious to everything. They think that the prince, who is clearly someone else, is still April somehow. Like, she's been a man this whole time and was just hiding it from them. Chris: Zuko flips out and assumes that they're kappa, which, for those of you who haven't read any Usagi Yojimbo comics, are basically giant turtle monsters. So... he's not exactly wrong. Matt: He also faints at the sight of Splinter, which is probably the only continuing gag/idea that carries over from the previous movies into this one. I'd faint the sight of this version of Splinter, too. He's terrifying, like a robot you'd see in a carnival ride. Chris: Leonardo uses his new book on Japanese swords to figure out that Zuko is from the past, so I guess that did pay off. I partially rescind my comments about April being garbage at buying presents. Matt: Zuko also, quite conveniently, speaks English, which explains why The Scarlet Pompernel is English, even when he looks as French as a baguette. Speaking of Alexandre Dumbas, he's explaining that Lord Norinaga believes April's a witch. He questions her and she answers that she doesn't understand Japanese. Her Walkman does, though, and starts playing the sultry sounds of Gloria Estefan at everyone. Instead of causing an instant dance party, however, it freaks everyone out and they break it. Chris: It's not just Gloria Estefan, it's a rap song sampling Gloria Estefan! April is down with what the kids are listening to these days. Or at least she was, before Lord Norinaga ordered his bodyguards to smash her Walkman to bits with their katanas, which causes the tape to slow down and fade out even though batteries are rolling across the floor. I don't know why this is where I'm getting hung up on accuracy, but there you go. Matt: Norinaga starts questioning April in English about what's happened to Zuko -- and I'm not sure why he didn't start that way, since that's clearly the language she spoke from the get-go -- and she decides to just pick up the witch thing and run with it, claiming to have shrunk some guys down into a Walkman. Where does she think this approach is going to get her? Chris: April makes a lot of questionable decisions in this part of the movie. After this guy smashes her walkman, she gets super pissed and tells him to cut out "the macho stuff," and while I realize that her sassiness is endearing, she should probably stop to consider that she just showed up in someone else's house, wearing his clothes and blasting the Miami Sound Machine. She's not a very good guest. Matt: Cardinal Not-So-Richelieu challenges April to shrink him down to prove her witchiness, and she continues with the threats. He offers to question her, but Norinaga wants her to suffer. Meanwhile, Donatello is finally doing some Donatello stuff. I finally got one thing I wanted, and all I had to trade for it was any semblance of a watchable movie. Chris: There is some pretty classic science-nonsense talk in this scene, too. Don says that he's going to "subtract the cosine from the inverted integer" and then just stops using actual words. His explanation for the magic time travel scepter is that it's "equal mass displacement," which means that in terms of mass, April O'Neil + Walkman = Prince Zuko + Katana, and again, that stretches credibility. Matt: People were smaller in the past, but maybe that's giving this movie too much credit. Chris: Especially since we can, you know, see him standing around helping Donnie with his calculations. 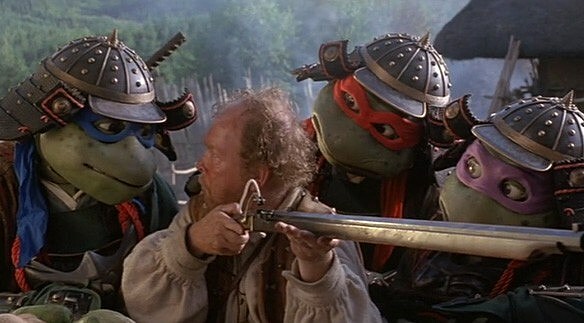 The Turtles decide that they need to go and bring April back... to the future!, but in order to do that, they'll need to switch places with four samurai who have the mass of six-foot martial artists with gigantic shells attached to their bodies. Lots of luck with that one, kids. Matt: For help, they've called in Casey Jones, who seriously enters the set like he's a wacky sitcom neighbor. I expected applause from the live studio audience. It's that blantant. "What shenanigans are we getting into this week?" he basically asks. Chris: Casey and his eyebrows are accompanied by a pretty awesome guitar riff, though. Matt: Not addressed: Why he disappeared completely in the last movie. He just says, "It's been a while." Chris: Also not addressed: His relationship with April. He doesn't seem to be bothered at all by the fact that she might be trapped in 1603 where she will be burned as a witch by evil samurai. Matt: Elias Koteas is kind of shunted off into this shot where he's separate from everyone else, too. It strongly feels like he did all this in one day, and probably in one take, while none of the other actors were there. Chris: While her boyfriend (I guess?) is casually chewing gum and shrugging about how she might die lost in time, April is chilling out in a cage in the rancor pit underneath Norinaga's castle. But then, Casey appears, only with short hair and a beard! What devilry is this?! Matt: Elias Koteas is a good actor who I like a lot, but English accents are not his strong suit. Chris: In the present (aka in the sewer), the Turtles are gearing up to go to the past, and in a moment that's actually pretty funny, Michaelangelo has put on shorts because he's the only one who has realized that the Turtles walk around naked except for masks and belts, which would make for a pretty awkward time for the dudes coming through. Chris: Mike then offers to give the rest of the Turtles some shorts, and Splinter loudly interrupts them and says they don't have time. Considering that putting on shorts is not a time consuming activity, the overall impression is that Splinter really, really wants to see some confused naked guys, so... Make of that what you will. Matt: Splinter also calls it "scientific debate," which stretches the meanings of both of those words. Zuko makes sure to inform the turtles that they should protect Avatar Mitsu, the leader of the rebellion. Chris: I'm not really sure why they don't just give Zuko the scepter and have him swap places with April again. In fact, none of what is happening up to this point has made sense, or even really introduced any kind of conflict that requires the Turtles' intervention. Matt: April would have to be holding it for them to swap, but he could just as easily go back, get April to hold the scepter, and send her back. But the turtles go for some reason, swtiching places with members of Norinaga's honor guard. And, you know how I mentioned the Highlander TV show earlier? These special effects seem to be stolen from it. Matt: They're wearing some kind of weird full-body jockstraps. The turtles weren't wearing those. Is the time-space continuum committed to keeping things PG? Chris: I honestly think those are in there to answer the question I've been silently asking for the last ten minutes, "Is Prince Zuko wearing April's underwear too?" 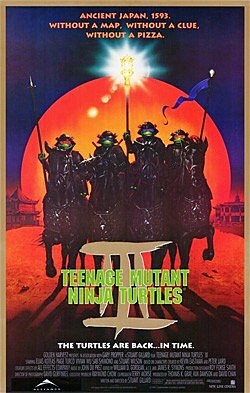 Matt: The turtles appear in the past on horses, in the middle of a battle. Michelangelo's riding one backwards for NO REASON other than komedy, and Leo wonders, "Hey, where'd we get these clothes?" HAVE YOU LEARNED NOTHING? Chris: There's some action that's goofy even by this movie's low, low standards, and then the Turtles get unceremoniously dumped in a river. Donatello talks about how he swallowed a frog and he "hopes it wasn't an ancestor," which betrays a stunning lack of knowledge about how reproduction works, and then Raph and Leo separately notice that Mike's gone, without Leo ever noticing that Raph has already stated this, out loud, to him. Matt: Leonardo is astonishingly stupid in this movie. Raph gets off pretty easy, I guess. His bandana has just turned orange. It's a brighter shade, anyway. Makes it a little bit harder to tell him from Mikey. Matt: Speaking of Michelangelo, he's lucky enough to be stopped by the Avatar, whose resistance fighters hurry him away. In the present, Casey, his oddly colored hair and Zuko prepare to fight the honor guardsmen, but Splinter waves them off. He wants no harm to come to these innocent men who just need the care and soft caress of an older, wiser ratman. Chris: Zuko also speaks to them in English, which is polite of him. He's a much better guest than April. Matt: Norinaga's soldiers return from battle, but he doesn't see his honor guardsmen, so he calls for them. The turtles freak out and hide under a hay cart while one of the soldiers mugs for like fifteen minutes. Norinaga gets upset that his guardsmen and the scepter seem to be missing, but not so much that he can't carry on a lengthy expository debate with Non ValJean. Chris: The Turtles take a moment to explain that their disguises - which are just their Samurai outfits - are working "so far," and that actually makes sense. They at least have masks, unlike the fetching hat/trenchcoat combo that we've already seen to be effective in the past. Walker's "So what if they went missing? War has a way of doing that to people" is actually a really sharp line that's delivered well, but it turns out that Norinaga is more fretting about the Magical Golden Time Travel Scepter that they were carrying for good luck. This raises quite a few questions about just what the hell this thing is actually supposed to do. Matt: It seems like Norinaga doesn't think of it as much more than a family heirloom. 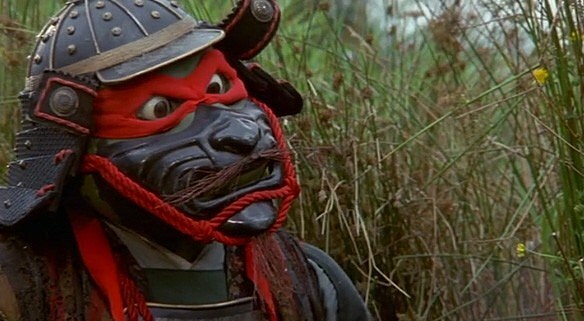 Walker's men go to the dungeon to grab up April, but the turtles follow them down there to use the ancient ninja art of the wet willie to send their leader away. They scare the dungeon master into putting himself in a cage with some basic ninja moves so April can reveal she has no idea she has been sent to the past. Really? Nothing clued you in? Chris: I've been trying for two whole minutes to write a sentence about how dumb that is, and I can't. And I write sentences about how dumb things are for a living. It's my actual job. Matt: Ye Olde Cafie Jonef asks for some help escaping, too, so April gets him out of his cage while the turtles fight off some guards. I'll give the movie this: They do actually use their weapons again. It's slapsticky as hell, but their weapons get used. Chris: This is such a weird fight scene, though. The Turtles are ninjas, right? I mean, it's 25% of their name. They get into the dungeon through subterfuge (or at least what passes for it in this movie), and then once they're trapped down in a room with exactly one exit, they decide it'd be a good idea to make a bunch of noise and fight every guard at Casa Norinaga, while making jokes about pinball that nobody around them understands. Matt: Lucky for them, April finds another escape: A sort of garbage chute that looks like what leads to a big pile of s**t, but that the movie takes its sweet, sweet time informing us is old food. All three of the turtles have to quip about it before they leave Old-Time Casey behind. Chris: Technically, a cesspit is "old food" of a sort. Matt: True enough. Mikey wakes up in a big pantry in a quaint little village, as kids look in and stare at him. The other turtles decide to look for him by standing next to a river and yelling his name. Good plan! Chris: Hey, be fair: It's not like there are a lot of dudes named "Michaelangelo" running around feudal Japan. If one shows up, there's a solid chance he's the right guy. Matt: April rips the pant legs off her outfit to reveal her gams so Leo and Don can quote Wayne's World at her. This is almost certainly lazy writing, but teenagers do love to quote their Lorne Michaels-produced films. Chris: Raphael wanders around a pleasant stream talking about how nice it is without any pollution - because, you know, 1993 - when a bunch of Mitsu's rebels attack them. I'm not really sure what the motivation is here. Is it because they're still dressed like Norinaga's men, or because they are no longer hiding the fact that they are gigantic green monsters? 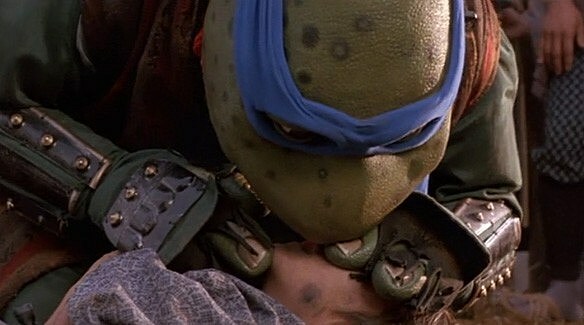 Matt: It would seem to be the former, because when the turtles finally take off their masks, Mitsu stops attacking and walks over to touch Raph's face. They trek to Mitsu's village, which they find ransacked and in flames. Turns out Mitsu knows English, too, which...why? Chris: Obviously because the English began trading with Japan in the late 16th century, Matt. Didn't you listen to Corey Feldman earlier? Matt: Rebels gotta trade, too, I guess. Walker and his men are looking to put the fear of God into the villagers, when a few of them find Mikey in his shed. They freak out at his reptilian appearance, which leads Walker to say he's just a sam-you-rai in a mask and chase after him. Vague, unclear hilarity ensues. Chris: The accents of Walker's men are hilarious cockney caricatures of bad guys, too. Mike ends up grabbing a pair of rapiers to defend himself because apparently a Japanese farm doesn't have any nunchuks, the weapons based on Japanese farm tools. Matt: The joke here seems to be that Michelangelo mistakes Walker for Clint Eastwood. How old does he think Clint Eastwood is? What does he think Clint Eastwood looks like? 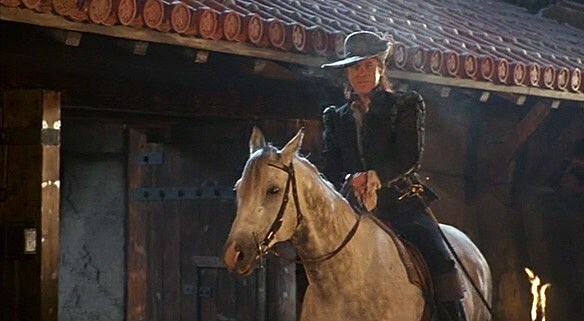 Has he somehow come to believe that Clint Eastwood was a French revolutionary? Chris: For some reason Walker decides to shoot Mike in the face, which doesn't make sense since there's a reward for bringing the honor guard back to Norinaga, the guy with whom Walker wants to trade. Also, while Walker's holding a gun on Mike, his henchman, Niles, aims a rifle and says "I'll save you, Captain!" as though the situation is reversed. Did this movie have a second draft? Did this movie have a first draft? Matt: He's also apparently aiming his rifle/musket AT Walker, because the other turtles wet-willie him from behind (they sure do love that move) and he shoots Walker's frilly hat off. Chaos follows, with the villagers eventually facing Walker (who now looks like Zorro, apparently) down. He escapes through a wall and the villagers celebrate, but oh no! 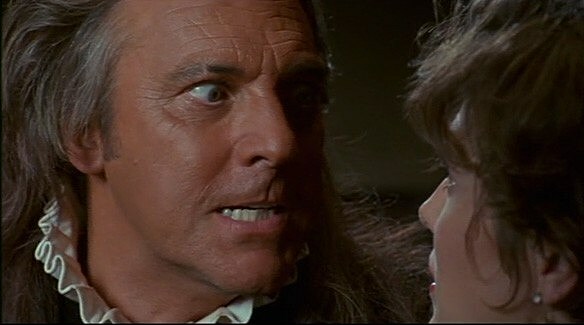 Shang Tsung's grandson is trapped in a burning house! Chris: The kid is screaming for help in English despite the fact that it's been established that these dudes speak Japanese (because the Turtles don't, for some reason), which is my favorite part of any lousy '80s/'90s movie where an American guy goes to Japan. It happens in Karate Kid 2, too, where guys are literally on the verge of death and they're explaining things to each other in English for the benefit of Daniel-San, who's thirty yards away during a hurricane. Matt: The characters sure seem to need the help, though. 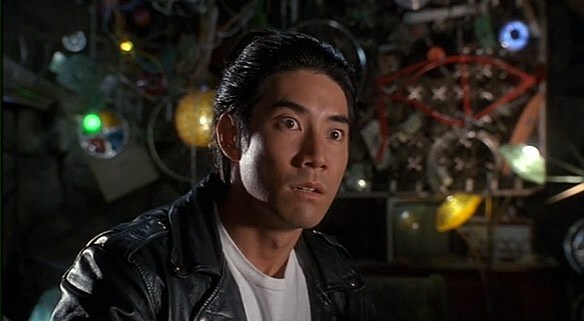 Shang Tsung and Mitsu both say the boy's name is Yoshi, and April says, "Yoshi?!?" like it's some kind of surprise that's his name. Maybe she was expecting a saddled dinosaur who eats goombas. Maybe she remembered that's Splinter's master's name, if I want to actually give her some credit. Chris: Yoshi requires mouth-to-mouth resuscitation, which leads the villagers to think that Leonardo (who they understandably think is a Kappa demon) is "casting an evil spell." They explain this, in English, to April, who gets all huffy about it as though this is not a pretty logical assumption given that the alternative is "time traveling monsters from America who were mutated by secret ooze." Matt: It is a little weird that Mitsu and her village more or less trusted the turtles -- remember they stopped fighting them when they took their masks off -- until just this moment. Michelangelo can risk his life to go in a burning building, sure, But this is just too far, apparently. Chris: Give them credit: It looks for all the world like Leo is trying to eat this kid's face. At the very least, if any of them ever took a course in CPR, they'll know that he's most definitely not forming a tight seal over the mouth with the nose closed. Matt: I don't know how he's doing it anyway. He doesn't have lips. But Yoshi finally rouses and everybody's relieved. So the turtles saved this village, Walker's been shamed, and Mitsu has the scepter, so they can all go home now, right? Movie over? Chris: Amazingly, we're only halfway through. Join us next week, friends, as we see if any sort of driving conflict actually shows up in the second half! I suspect it will not! Previous Installments of CA vs. TMNT!